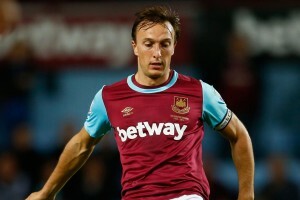 Mark Noble is looking for a top result tonight and is taking much confidence from the result at the weekend. Speaking ahead of the EFL quarter final he said: “The Premier League is important to us because of the position we find ourselves in and we need the points. We have tough games coming up against Arsenal and Liverpool. “But we can now look forward to a big game in the Cup against Manchester United once again and going to play at Old Trafford is everyone’s dream so we hope for another good result. He added “It was a tough game on Sunday, especially after we took the lead so early on. We knew they were going to come at us and they did during the opening 45 minutes. “But in the second half I thought it was more even and both teams had chances to win the game. “Sometimes you just need that bit of luck and Darren made some great saves for us. I thought the defence played really well and we were really resilient as a team. And sometimes you need a midfielder that has the ability of keeping up with the pace of the game, passes the ball forward and takes a free kick that doesn’t cause your own defence a problem eh Captain Slow?